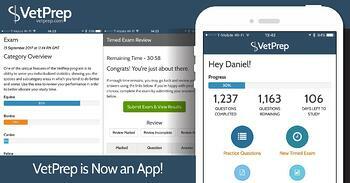 VetPrep is Now an App! Hey guys Dr.Cari Wise from VetPrep. I'm so excited about a new feature that we've developed that I decided to jump on here and tell you about it in person. We know you love VetPret, it's the premier study tool for the NAVLE and now you have no excuses not to study. VetPrep is now an App! It's available for Android and Apple devices. So just go to Google Play or the App Store and download it today.